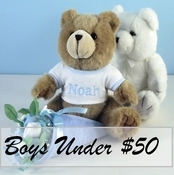 Our gifts for baby boys are categorized below to help you find just what you've been looking for. We design with an eye for the unique, using rocking horses, mini wagons, baskets, and more to create gifts that are memorable and thoughtful. Our selections are perfect gift giving choices, whether for baby showers, christenings, gender reveal parties - you name it. Shipping is always free within the Continental U.S.